Even though you can no longer upload videos to Google Video, the service hasn't been abandoned and it's still actively developed. The focus has been switched to video search and Google Video powers YouTube Search. I still think that disabling the uploads to Google Video was a mistake: probably the most useful videos hosted by Google Video are longer than 10 minutes and couldn't be uploaded to YouTube. 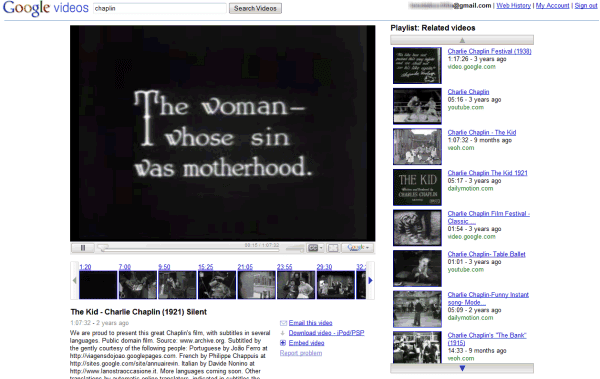 You can't upload Charlie Chaplin's "The Kid" to YouTube without splitting it. To make the transition to YouTube easier, Google redesigned Google Video, removed some features that were rarely used and made the video player smaller. You can use Google Video in Google Apps. I thought it was possible to upload videos > 10 minutes if you had a director account (which are free anyway). What are the restrictions on those? Google Video was a perfectly good service that serious video uploaders (such as myself) used because of the higher display quality and the longer length. So Google broke it. YouTube is no substitute. Though you can upload longer videos with the Director account, you are still limited as to size. Also, the player has been (as noted in this post) reduced to (poor) YouTube quality. As a consequence, I now use blip.tv to upload videos. I thought sure that when they bought YouTube they would merge it into Google Video, keeping the best features of both. Wrong again, that would make too much sense. They need to answer the question: "What were you thinking?" My God, the new Google Video design is a complete waste of my computer monitor's screen space. When are people going to learn that "if it ain't broke, don't fix it." Bring back the old design! Bring back the old-old design! Closed captioning search!!! Plus the older player had a lot of stuff on it, making it look very complete. This one has to much extra screen space and just looks empty.